Rugby & Northampton Athletic Club’s young athletes impressed in front of a star-studded audience at the Sainsbury’s Indoor Grand Prix on Saturday. Team GB athletes Mo Farah, Greg Rutherford and Katarina Johnson-Thompson were among those in attendance for the event at the National Indoor Arena, Birmingham, with teams arriving from up and down the country to compete. R&N had six teams across three different age groups entering in the 4x200 relays, and the under-13, under-15 and under-17 squads all impressed around the track. Meghan Lawes, Zoe Gardner, Mica Quinn and Megan Burge made up the under-13 girls’ team, and they put in a superb display to take second place in a time of two minutes and 6.88 seconds. They were pipped to the post by Halesowen AC, who snatched victory by less than seven tenths of a second, crossing the line in 2:06.20. In an incredible coincidence, the under-13 boys team of Dan Carey, Will Dean, Eoin Hutton and Josh Farrell recorded the exact same time as their female counterparts to finish third in the men’s race. Halesowen were again victorious, breaking the two-minute barrier with a fine display. There was an impressive third place on the podium for the under-15 girls too, with Birchfield Harriers and Halesowen finishing first and second respectively. The R&N quartet of Katie Print, Anousha Salehi, Elizabeth Truslove and Lucy Laight ran the distance in a time of 1:54.09. The under-17 men went one better though, securing second in 1:37.89. It was a fine effort from Aidan Leeson, Josh Faulds, Jay O’Leary and Tom Jasper in their first year at under-17 level, as they pushed winners Birchfield Harriers all the way. R&N’s female team in the same age group grabbed fourth place in 1:56.23 amongst a strong field, in a race hampered by falling athletes. Mia Rudman, Milan Clues, Alice Grocott and Kiona McLennon passed the baton around in 1:56.23, while an inexperienced under-15 boys’ team also shone. The foursome of Jaime Nalus, Bradley Whitehead, James Sheaf and Sam Whittaker’s time of 1:55.33 earned them fifth, with the race seeing Halesowen triumph for the third time on the day, before all the athletes were given the chance to rub shoulders with some of their heroes. Elsewhere, a number of R&N athletes were in action at the National Indoor Championships at the weekend. The competition, for under-15, under-17, and under-20 athletes, took place in Sheffield and R&N returned home with three bronze medals. Following her appearance on the NIA track, McLennon was back in action and impressed by taking third place in the under-17 shot put. 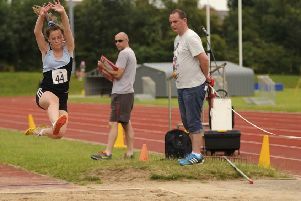 Club-mate Eleanor Broome followed suit in the long jump, leaping 5.83 metres to secure bronze. Oli Lambert was on form over 200 metres in the under-15 boys’ race, taking third place on the podium with a time of 24.02 - just 0.41 behind the winner, Poole AC’s Thomas Casson. Lambert also qualified through the heats to reach the final of the 60-metre sprint, where he finished seventh with a time of 7.65. There were more finalists over the two-day event, with Molly Barnett unlucky to miss out on a medal in the 60-metre hurdles. Barnett finished fourth but only 0.01 seconds behind third-placed Olivia Montez-Brown in a fiercely-contested race. Under-20 athletes Adam Wright and Caleb Downes both came fifth in the finals of their respective events, the 800 metres and the 60 metres. Wright completed the four laps of the 200-metre track in 1:55.34, and Downes’ sprinted home in 8.89 seconds in a race of real quality, with the top four all breaking the seven-second barrier.